A. Lyons & Co., Inc. specializes in made-to-print screws and made-to-print bolts produced to customers’ exact requirements in Manchester, Massachusetts. Look no further for custom screws and bolts, non-standard screws and bolts, and custom made screws and bolts. Contact A. Lyons & Co., Inc. today to request a quotation, place an order, or to request further information about made-to-print screws, made-to-print bolts, and more. In addition, A. Lyons & Co., Inc. is a leader in a range of traditional screws and bolts including self-tapping, self-drilling, machine, SEMS, leg leveler, sheet metal, TEK, particle board, chip board, drywall, and a range of other screws and bolts. 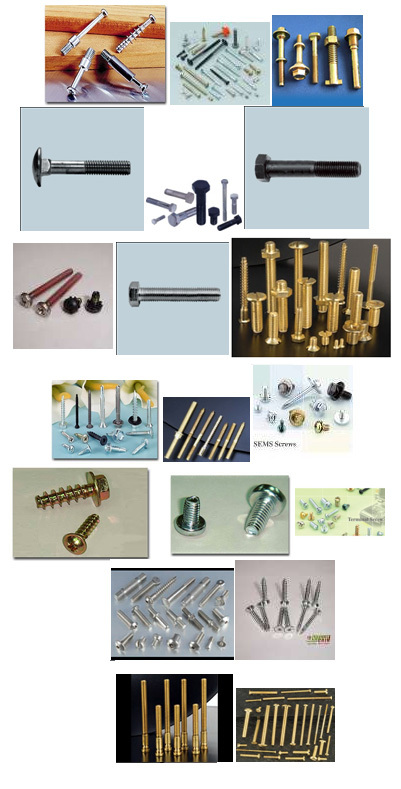 Head styles include pan head, oval head, countersunk, flat with ribs, hex washer head, truss head, flat head, fillister head, binding, indented hex washer head, and more head styles for screws and bolts. Recess styles include phillips head, square head, square/phillips head combo, phillips/slot combo, pozidriv head, torx head, and more recess styles of screws and bolts. Contact A. Lyons & Co., Inc. today to request a quotation, place an order, or for more information about traditional screws and bolts. We have developed excellent sources in the Pacific Rim and Europe who specialize in screws and bolts used in many demanding industries and applications, as well as for construction, and A. Lyons & Co., Inc. is prepared to meet any non-standard screw or non-standard bolt need. We can supply products that meet IFI, ANSI, DIN, and JIS standard and that can be made to our customer’s prints, samples or industry standards, and in a variety of materials, finishes and packaging. We can have mill shipments drop shipped directly to your warehouse, or offer a stock and release program from our North Andover, Massachusetts warehouse and excellent customer service from A. Lyons & Co. Inc.‘s Manchester, Massachusetts headquarters. A. Lyons & Co., Inc. offers traditional and custom made screws and custom made bolts in Manchester, Massachusetts and are always prepared to meet your company’s requirements. Contact A. Lyons & Co., Inc. today to request a quotation, place an order, or for more information about screws and bolts. A wide variety of materials, threading, and plating are available. Roller, laser, or optical sorting is available and knitting, poly-bagging, and assembly is available before shipping. Contact A. Lyons & Co., Inc. today to request a quotation, place an order, or for more information.